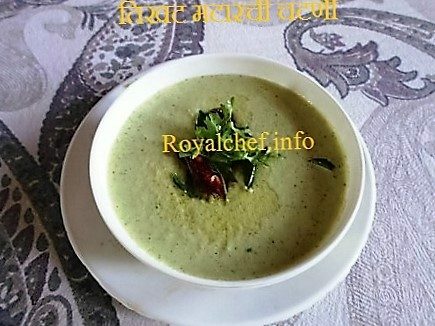 This is simple to implement recipe for making at home typical Restaurant or Dhaba Style Sukha or Dry Maharashtrian Chicken Gravy. 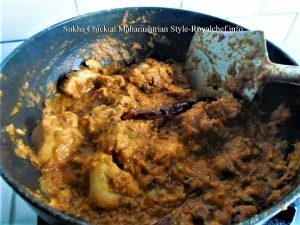 This Sukha Chicken recipe given by me is a great main course Chicken dish, which tastes good with Parathas, Puris or Fried Rice. Slice the Onion and Green Pepper very finely. Heat the Ghee in a Kadai and fry the Onions until they are golden brown and crispy. Then remove the Onions after draining the Ghee. Fry the Chicken Pieces in hot Ghee over a medium flame. Keep turning the Chicken Pieces constantly so as to avoid to avoid burning or sticking to the Kadai. When the Chicken Pieces are half cooked add the Ginger, Green Pepper, Chills, Pepper, Salt and 250 Milliliters warm water. Cover the Kadai and simmer until the Chicken Pieces are tender. Serve hot with Parathas with the Fried Onions sprinkled on top.